5. I found it difficult to credit that these three households were not “show pieces” and said as much to my guide, Mr. McKinnon. He protested, however, that they were no more than the normal standard for the town of Halifax and in fact that he could show me superior ones. He offered to take me to visit any child I might care to mention and urged me to inspect some of the foster-homes in the country districts. I shall hope to take advantage of this invitation on my next visit to Nova Scotia. 6. 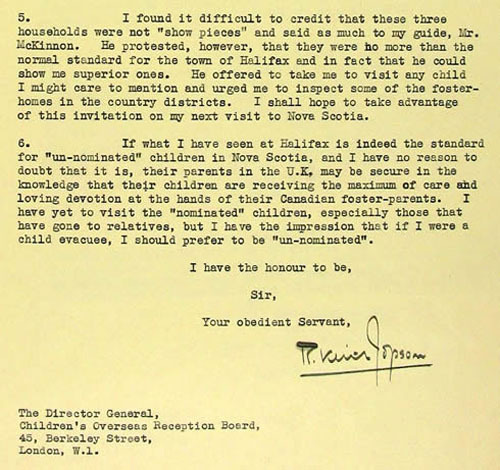 If what I have seen at Halifax is indeed the standard for “un-nominated” children in Nova Scotia, and I have no reason to doubt that it is, their parents in the U.K. may be secure in the knowledge that their children are receiving the maximum of care and loving devotion at the hands of their Canadian foster-parents. I have yet to visit the “nominated” children, especially those that have gone to relatives, but I have the impression that if I were a child evacuee, I should prefer to be “un-nominated”. 9. Read Source 9. Near the end of the letter, the author writes, ‘I found it difficult to credit that these…households were not “show pieces”‘. Why do you think he wrote this?